The mom is what is called a cholita here. They are indigenous women, Aymara or Quechua. The term was originally a derogatory one–women of mixed blood; usually half Spanish or other white race. Even as little as ten years ago, they were not allowed to do many things like riding public transportation. They can be recognized by their long, twin braids and their hats. Their hats tell where they are from if you know the “code” (which we do not). The more typical bowler hats you often see in pictures are typical of La Paz, and you do see some here occasionally. Many people still look down on them. There is a group of cholitas here who originally came from Potosí; another town who had suffered droughts for numerous years and many left to find work in other places. Cochabamba was a favorite destination due to the temperate climate. We have been told that they go out in the daytime, mostly selling small items in their baskets. 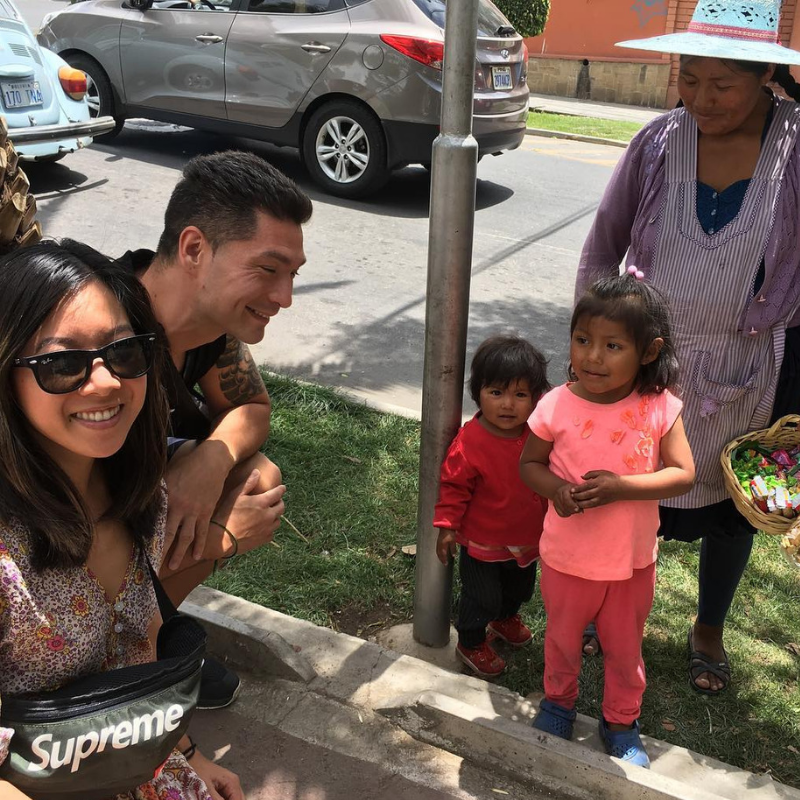 At night, they are allowed to sleep together with their children and any men that might be with them in La Cancha, the large market area here in Cochabamba. In return, the men provide security for sections of La Cancha. Most of the women have no husbands for various reasons, usually abandonment for another woman. We don’t even know her name for sure or that of the two girls. We have asked her a few times but have trouble understanding her. We were told not to ask her to write it down as she may not know how to read and write. She does speak and understand basic Spanish but Aymara may be her native language. At first, she wouldn’t make eye contact. Because we stop here to buy something every week when she is in her “spot”, we are gaining her trust. She smiles and will answer our greetings. The oldest has been getting the basket and bringing it to us for several months. The younger one, who is just now walking fairly steadily, just started trying to get the basket and bring it to me the last two times we saw them. She can’t quite hold the basket so, during our last visit, she just picked up a piece of candy and held it out. Next time, we will buy it no matter what she holds out. We save all the centavos we get. They sell the chiclets for 50 centavos each little box of two (or about 7 cents U.S.). We typically throw in an extra 20-50 centavos. We were adding an extra 2 Bolivianos (28 cents U.S.) but she said: “No, too much.” So we usually buy 2-4 little boxes each time we stop. Sometimes we buy bubblegum for our surrogate grandson who uses it each day to strengthen weak muscles in his jaw. We buy tissue packets when she has them. We have been hesitant to buy the snacks as she repackages them from a large bag using just her hands. It’s a delicate balance of wanting to buy from her and wanting to stay healthy, too. She finally agreed to us taking pictures of them a few months ago. Most do not want their pictures taken. We try to stay and talk a little longer each time. We hope to invite her to church services for Christmas.